Australia is simply amazing. It’s a place that pulls people back time and again. And, it’s no wonder. Few other countries offer such a broad range of activities, while also boasting of spectacular scenery. If you’ve been following me for a while, you’ll already have a fair idea of your options for an activity-filled stay. From Perth to Sydney, there’s plenty to do if that’s what you desire. But, that’s not what we’re looking at. Instead, we’re going to focus on how to enjoy the more chilled aspect of Australia. We all know it’s there, right? Yet, many of us fail to acknowledge it while we’re there. If you’re ready just to kick back and experience a full escape, these options may be perfect for you. Australia is a tourist-heavy destination. As such, hotels are booked well in advance. Bunking in a full-to-capacity hotel might not be what you had in mind. If that’s the case, look outside of the cities for more secluded destinations. Something like the Wollemi Wilderness Retreat Treehouse in the Blue Mountain Bushland could be the ideal thing. Up in the trees, you’ll be away from all the hustle and bustle. This would be perfect for a lover’s retreat, or even just a solo search for peace. Many people also recommend these Margaret River wineries for this purpose. Margaret River is Australia’s premier wine region, and is like a world removed. Here, you could opt to stay in luxury forest chalets, and do a little wine tasting during the day. The best of both worlds, surely? Nothing is as good for relaxing while away as days at the beach. Luckily, Australia boasts of some amazing ones. You can take your pick from options like Rainbow Beach in Queensland, Belongil Beach in New South Wales, and much more. Which beach is right for you depends on what you’re after. 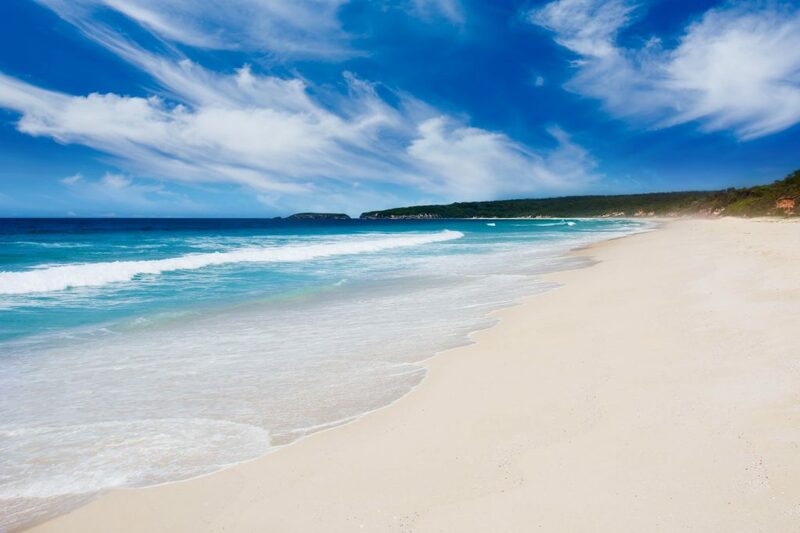 Rainbow Beach is a secluded option, with natural attractions like The Cooloola section of the Great National Sandy Bark. Belongil Beach is a more crowded option and is ideal if you want the chance to try your hand at watersports. This is the perfect choice for people who like to listen to the hustle and bustle while they sunbathe! When in Australia, it would be crazy not to give surfing a go. This is especially the case given that chilling out is the aim of this holiday. After all, you don’t get much more chilled people than those surfers. There are two main reasons for that; for one, riding the waves creates a real sense of calm communication between you and the waves. At the same time, surfing becomes a kind of meditation which is sure to clear your head. If you’ve never surfed before, now is the perfect time to give it a go. Learning to surf in Australia is like learning to cook pizza in Italy. It has to be done!